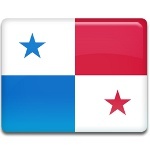 The flag of Panama is a rectangular banner divided into four quarters. The upper left and lower right fields are white, the upper right field is red, and the lower left field is blue. On the upper left field, there is a five-pointed blue star. The lower right field contains a similar star, but it is red instead of blue. The colored quarters and stars represent rival political parties (blue stands for Conservatives, while red symbolizes the Liberals), while the white quarters represent the peace in which they operate. The flag was designed by Maria de la Ossa de Amador, the son of the Panamanian leader Manuel Amador Guerrero. It was first presented in 1903, but the formal adoption took place on March 25, 1925. However, Flag Day in Panama is celebrated on November 4, following the country's Independence Day, which gives Panamanians two public holidays in a row. Panama's Flag Day is marked with flag hoisting ceremonies, colorful parades and other festive events and activities.